Hope you all had a wonderful Thanksgiving filled with much to be grateful for and are entering the month of December with a hope and gratitude filled heart! Bless and Be Blessed today Butterflies! I was down in NYC for Thanksgiving and it was all kinds of awesome. Hope you had a nice one, too. Very true love this! Who needs new years resolution they never keep anyway! This is such a great reminder. I don't do New Year's resolutions so I try to live by this all the time! This is a great post. Everybody always waits for the new year to try to improve themselves. Why wait? Start now! Great inspiration! Still a lot that can be done this year! I don't do New Year's Resolutions, but you can definitely make a change any time you want! It doesn't have to be the new year. Great quote! I don't make resolutions for the New Year. However, when I notice I need a change, I put one into place immediately. No sense wasting time on what can be fixed today. That's a great thought and so true. Each day is a chance to start anew. Thanks for the inspiration! So true. Tomorrow the sun will come up. Thanksgiving was perfect. Great quote - you are so right everyday is the start of new. I love this! It's so true! However my OCD in me loves the new year to start fresh as well! True all you need is a new mind set to cause a change in your life not a holiday. Your graphic is totally true! 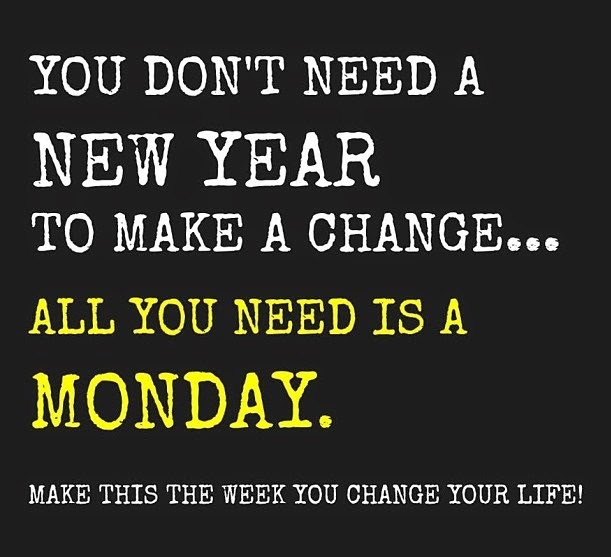 Every Monday can be a fresh start if you let it! I make so many changes starting Monday. Now, only wish they would last the whole week. I don't do new years resolutions. If you want to make a change you just have to start. The sooner the better. I try to look at each day as a new day to try to live better. Some days are easier then others. Very true! I love your positive attitude and outlook on life. I did have a wonderful Thanksgiving, thanks! I hope that you did, too! Such an amazing outlook. Thanks for sharing this quote with us. I'm going to share it with my friends. This phrase is perfect. I love new beginnings. I can't believe it is December already! I don't like to wait for the new year to make changes. This is very motivational. People tend to use the resolution as an excuse to wait for a whole new year instead of going for it now. Omg isn't this the truth! Why wait.. get after it now!